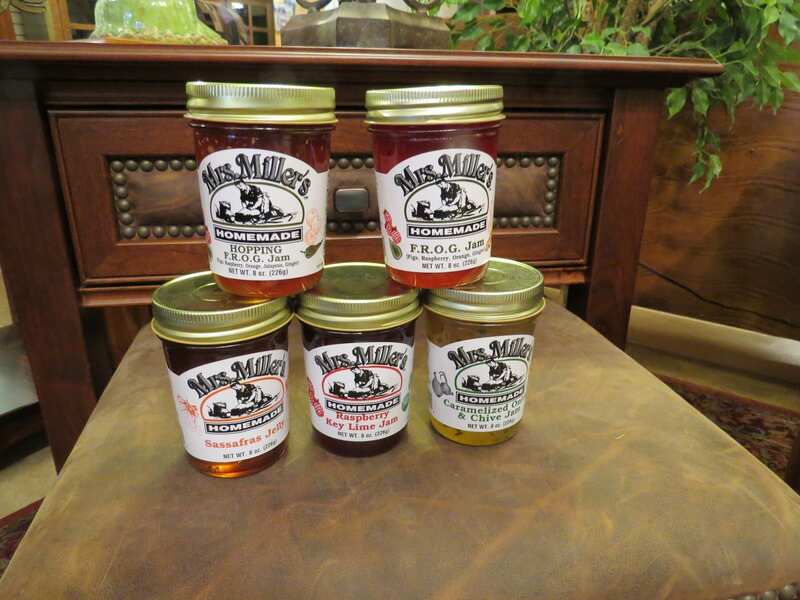 Mrs. Miller’s Homemade Jam and Jelly—New Flavors Are In! One of the things that we are proudest of at Amish Originals is our support of local products. Local craftsmen make all of our furniture, but we also have some new and yummy consumables in the store—jams and jellies made by Mrs. Esther Miller of Fredericksburg, Ohio. Mrs. Miller, a successful Amish entrepreneur and foodie, has been making noodles, jams and jellies since 1973. Peel and slice eggs in half lengthwise. Spoon or pipe evenly into the egg whites. Mix first six ingredients together in a medium bowl, until well blended. Form the mixture into a ball and flatten slightly on top. Wrap tightly and chill for several hours. Before serving, pour the jam over the top of the cheese ball and serve with crackers. Stop by the store on the First Fourth Friday of the season on April 26—we’ll have Mrs. Miller’s products out so you can taste them for yourself!